Ask someone who loves cooking about the one important tool in his/her kitchen. The reply is most likely going to be a food processor. A food processor is definitely a blessing due to the amount of time it saves. 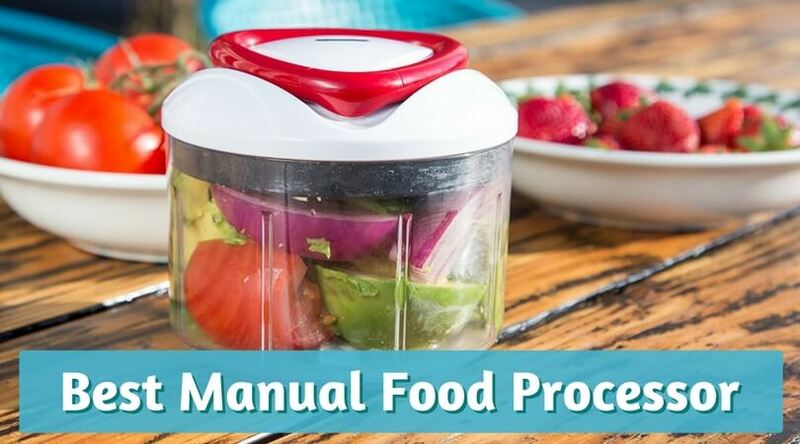 Although the market is now flooded with high-end electrical food processors, your humble manual food processor is still as efficient, and these reviews of the manual food processors prove just that. 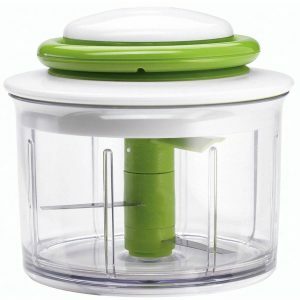 This best hand food processor from Arugula is all that you need for slicing vegetables perfectly. 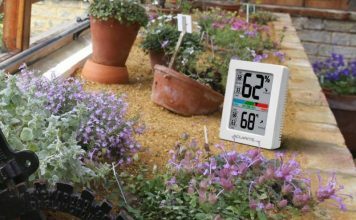 This small device is easy to use on your trips as well. Fill in your ingredients, place the lid and pull the cord to spin the blades. You can instantly slice veggies or puree them based on the number of times you spin the chopping blades. 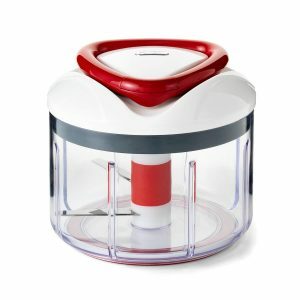 The manual food processor also comes with a storage lid that you can use to store your chopped or blended ingredients in the bowl. You can now easily prepare pesto sauce, guacamole, hummus, salsa, and other dips easily. Chop fruits, vegetables, herbs, nuts, and even meats by hand. Runs without electricity and can be used in small kitchens. Pull the cord to spin your ingredients and chop them. Easy-to-wipe bowls that do not let you worry about cleaning up after cooking. 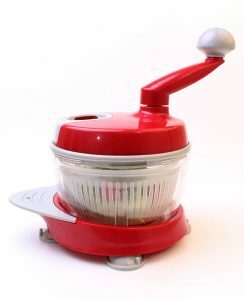 This hand crank food processor from Kitchen + Home is a must have in your home kitchen. If you are someone who likes getting all the chopping, blending, or slicing is done in one go, then this device is for you. The manual food chopper comes with a set of blades based on the type of cut that you want. You can put your vegetables in the manual food processor and then rotate the hand crank to dice them. For huge chunks, you can rotate the crank slowly. 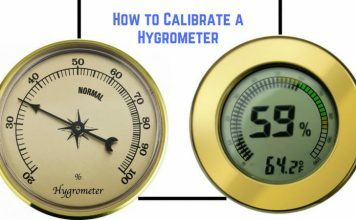 You can also vary the speeds based on whether you want to dice, chop, or squish a particular vegetable. Uses stainless steel triple curved blade edge called as the Samurai blade. No specific skill needed. 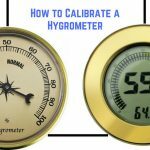 Extremely easy to understand and use. Functions as egg white separator, storage lid, and shredder. This hand food processor from Zyliss is the best tool for chopping, blending, and pureeing. It has a 25-ounce bowl with a Swiss design blade. 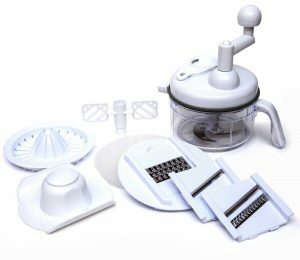 This hand held food processor comes with a foldable handle that you can open and pull to slice your vegetables or fruits. 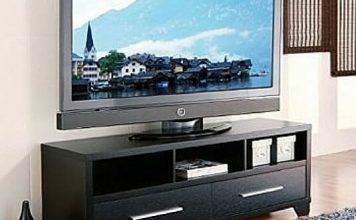 This high-quality Swiss design is an emblem of quality and durability. Multi-blade food chopper that blends ingredients in seconds. Booster arm at the top and bottom that prevents food from sticking. Great for use while traveling and camping. It cuts the toughest foods like carrots. Chop or blend your ingredients. 5 years guarantee from Zyliss. This best hand crank food processor from Prepworks is all that your modern kitchen needs. Made from high-quality material and easy to use, this simple food processor is perfect for making your everyday salad, salsa dips, and more. The food processor features an egg separator and a salad spinner as well. The stainless steel blades and blending attachments can help you chop or blend vegetables as per your requirement. In addition to this, the manual food processor also has a drip-free spout that you can use to pour your juice or salsa sauce into the bowl. 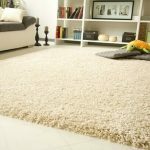 This device is also easy to clean. Perform a large variety of tasks with a single unit. Hand crank for slicing, chopping, and blending. Comes with a salad spinner and egg separator. 4 cup liquid capacity perfect for making your salsa dip. A great gift for the foodies. This manual food processor can add amazing chopping power to your kitchen. You can chop vegetables, prepare salads, and separate eggs with this food processor. A simple turn of the crank is all it takes to speed up your cutting process. 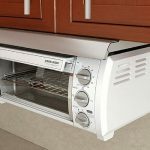 It consists of a two-part blade that slices up ingredients faster and has a double sided blade that allows you to cut in both directions for maximum power. Stainless steel 3-prong chopping blade, salad spinner, and egg white separator that makes your daily life easy. Compact size that can easily fit in your kitchen cupboards or corners. Easy to use and clean. Low maintenance. 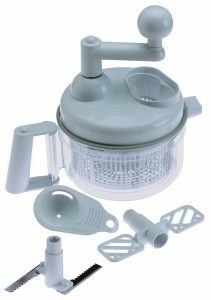 Kitchen King Pro Complete food processor is the best hand food processor that lets you easily chop your vegetables and fruits. The special feature of this bowl is its base that locks in the bowl and gives it the much-needed stability when you are using it. 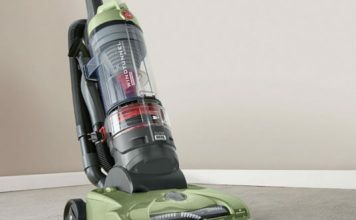 Easy to clean and use, the unit comes with top-notch parts. This manual food processor is all that you need to slice, dice, and chop ingredients. All you need to do is fill the bowl with ingredients and rotate the hand crank to instantly slice the ingredients. It takes about 12 spins to be able to dice the contents. Also, the Mandolin lid on top ensures that food does not spill out while using it. You can switch in between the Mandolin slicer and Julienne slicer. Sharp tri blades for easy slicing and chopping. Comes with a base for stability. Mandolin and Julienne slicing modes. Hand crank for powering the device. This best manual food processor from Gourmet is all that you need when you are tired of having to chop your vegetables by yourself every day. It is the perfect helping hand in the kitchen, and moreover, it is easy to use. It has a bowl, a tight lock lid, and a selection of blades that give slicing options to the user. 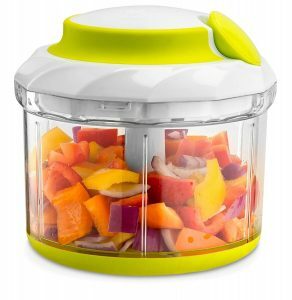 This hand food processor is perfect for making salads and sauces as well. The best part of this device is that it is portable and does not need electricity. 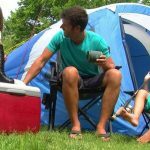 You can carry it on all your camping trips and save up lots of time and energy. The BPA-free plastic parts are resilient and last long. The air tight lid and storage lid are also of top notch quality. The blades in the device do not rust. 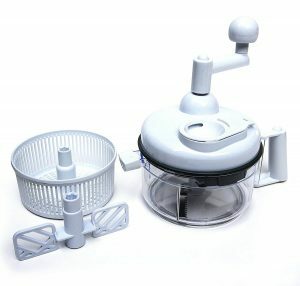 Multifunctional food chopper that allows you to dice, chop, and blend ingredients. Comes with removable blades that you can choose based on the need. 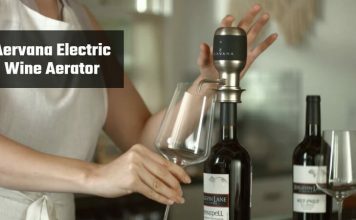 Pull string operation -Ergonomic handle that lets you control the spinning blades. Small and powerful- Is capable of handling tough jobs as well. You can use it to slice meat, tomatoes, carrots, etc. These simple and easy to use hand food processors can make your life easy. With them, dicing vegetables or preparing salads and sauces is now a piece of cake. Lightweight and easy to handle, you can carry these manual food processors on your trips as well. We hope that these food chopper reviews can help you choose the perfect food processor for your home and kitchen.